We continuously travel around the world to facilitate drilling workshops and performance coaching. When we speak to people, we find that many are unaware of the extra products and services that we offer on the web. This page will highlight websites that are either wholly owned and operated by Relentless Pursuit of Perfection, or that have very close ties. 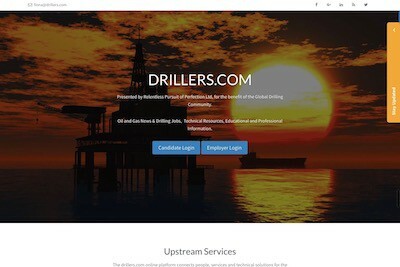 Established in 1996, (and continuously online ever since), drillers.com is the oldest oil and gas jobs site in the world. This website is wholly owned and operated by relentless Pursuit of Perfection Ltd.
Over the years drillers.com has helped countless people to find work, and access technical knowledge and tools. Even now, the site is going from strength to strength, helping hundreds of thousands of oil and gas people every year. In addition to the long-term focus of the site such as oilfield job opportunities, a knowledgebase and drillers engineering calculations… We’ve added an industry events calendar, expert partners and companies, a skill pool, and over a hundred new in-depth articles. We’ve done this and more just in the last couple of years. 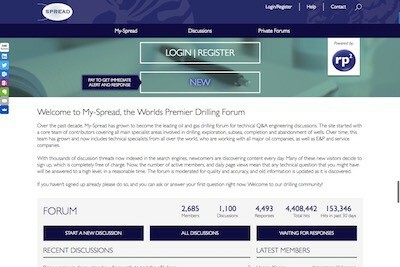 My-SPREAD is the worlds leading technical drilling forum. Drillers.com offers information and assistance to the beginner, intermediate and experienced oil and gas personnel. SPREAD caters more to the elite in O+G engineering and technology. While students and inexperienced geologists, engineers and planners are welcome to join, you’ll find cutting-edge tactics discussed. SPREAD is a group of almost 2700 technically minded people, joining together to help solve each other’s drilling problems. Without ego or the usual company hierarchy, a free flow of ideas and strategies get generated. Aspiring leaders of tomorrow, brainstorm with the titans of today. Join now, if you haven’t already! Labrador Petro-Management (LPM) was established in 1987 and the first of its type in Australia – to provide drilling project management services and supply drilling consultants to a growing local oil and gas industry. LPM has grown to become the premier provider of well construction services and professionals in Australia and New Zealand. LPM is owned and operated by active Senior Drilling Professionals with a combined drilling and completions experience onshore and offshore of over 100 years. LPM operates under ISO 9001:2015. Drilling and Completion Consulting – providing fit for purpose specialists for well planning, operations management and field operations supervision. Subject Matter Experts – available for special projects, peer reviews and expert witness reports. Drilling Project Management – from feasibility through to wrap-up utilizing LPM’s Drilling Management System. Well Control Assistance – Blowout Contingency Plans, relief well planning, source control exercises and incident response.